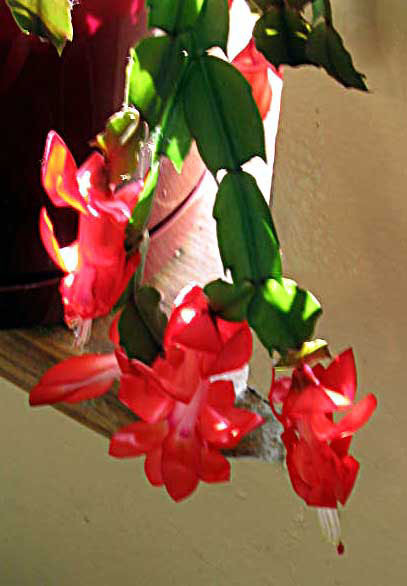 The Christmas cactus has bloomed! A note to would-be admirers--Pretty Lady does not like daisies. Well, she likes them, of course, but she PREFERS flowers as exotic, multi-dimensional, intricate and lavish as herself. Her favorites are--heavily scented roses in shades of peach and lilac, sweet peas, lilies, freesias, gladioli, tulips IF they are healthy and in season, and, of course, orchids. What lovely plants you have! You certainly must take excellent care of them. Thank you for sharing. And thank YOU for noticing! Yes, I confess I do spend an inordinate amount of time in watering, fertilizing, re-potting, pruning, rooting, adjusting light levels, fretting, and just sitting with my dear ones and admiring them. Someday I shall retire to a hut with a greenhouse and a little plot of land, and be perfectly happy. 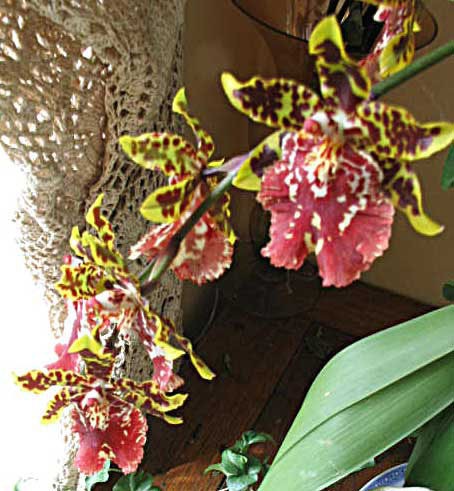 How is your phalaenopsis that you posted about before? I had to go look up its name to make sure I had spelled it right. My plant book said it could have up to a three foot spray of flowers, I'm very curious to see a picture when it blooms, the sketch in the book would not do any orchid justice. The phalaenopis is working away on the spike, but it will not be blooming for a few months yet, I fear. I am fertilizing it every week. I will definitely be posting a picture! The flowers, as I recall, are pure white.